For those who are allergic to bees, getting stung can be a life-threatening experience. 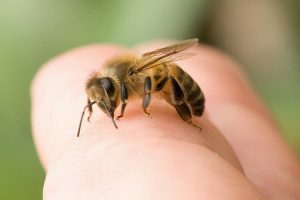 A sting may cause hives, rashes, dizziness, anxiety, difficulty breathing and swallowing, a sharp drop in blood pressure, a dramatic increase in pulse rate, and swelling of the face, throat, and mouth, among other symptoms. If you experience any of these reactions following a bee sting, seek emergency medical assistance immediately. For those who are not allergic, bee stings are basically harmless. They cause pain, swelling, redness, and inflammation at the site of the sting. There are several ways to relieve these symptoms at home, using simple, inexpensive ingredients that don’t cause side effects. Use a fingernail or a pair of tweezers to remove the stinger from the skin, then wash the sting with warm water and mild soap. Once the area is clean, apply an ice pack or cold compress. The cold numbs pain, relieves itching, and constricts blood vessels to slow the flow of bee venom through the body. Fill a Ziploc bag with ice. Wrap the bag in a clean towel. Apply it to the site of the sting. Leave on 10 minutes, take off for 10 minutes. Again place an ice pack for 10 minutes by refilling the bag with ice when it melts..
Continue for every 4 to 5 hours until you get relief from pain and swelling. Papaya contains an enzyme called papain, which neutralizes bee venom. Raw, green papaya has the highest concentration of this enzyme. Place a slice on the bee sting for 15 minutes, then remove and rinse, or try the methods outlined below. Before bed, apply juice to bee sting and let dry. Cover with bandage and leave on overnight. In the morning, remove bandage, rinse, and repeat. Apply mashed papaya to bee sting. Repeat daily until bee sting has healed. Mustard has anti-oxidants, which heal bee stings, and selenium, which reduces pain and inflammation. Grind mustard seeds to make a powder. Leave it on 20 minutes, then rinse. Repeat daily to get relief from bee sting. Mix 1 teaspoon mustard powder with enough water to make a paste. Wrap the paste in a clean thin cloth. Place it on the sting and hold it there 15 minutes. Repeat regularly until bee sting heals. Plantain leaves are antibacterial and anti–inflammatory. They prevent infection and reduce pain, itching, swelling, and redness. Plantain leaves also contain a natural astringent called tannin, which helps heal the skin. It is also used to treat rashes, cuts, insect bites and also snake bites. Wash a fresh plantain leaf. Chew a piece until it is pasty, make sure not to swallow. Take it out of your mouth and apply it to the bee sting. Leave on few hours or overnight. Your saliva has antibacterial properties which will help to prevent infection. Bee venom contains formic acid (also called as methanoic acid) and this is acidic in nature. Baking soda is alkaline, so it neutralizes the formic acid and reduces pain. Mix 1 teaspoon baking soda with enough water to make a paste. Apply it to the bee sting. Let it air-dry, then rinse with water. Repeat 3 times a day until the sting heals. Mix 2 teaspoons of baking soda with 1 teaspoon of yellow dock leaf tincture to make a paste. Apply the paste to the bee sting and let it air-dry. Repeat regularly until the sting heals. Basil is naturally antibacterial whuch restrict the growth of bacteria in the body. It contains an anti-inflammatory agent called eugenol, which reduces redness and swelling. Crush fresh basil leaves to make a paste, apply it to the bee sting, leave it on 15 minutes, and rinse. For Quick relief follow the remedy listed below. Crush handful of basil leaves and add 2 teaspoons of turmeric. Apply to the bee sting area and let it dry. Repeat regularly 3 to 4 times a day to get rid of bee string. Lavender essential oil is a natural antihistamine. It also has anti–pruritic and anti–inflammatory properties that prevent infection and reduce pain, redness, itching, and swelling. Make your own lavender oil using the recipe below and apply it directly to the bee sting regularly until the sting heals. Heat 1 cup of any oil (like olive / sunflower / sweet almond / Jojoba / grape seed oil) over low flame. Stir in ½ cup dried lavender flowers. Use cheesecloth to strain the oil and store it in a bottle. Apply this oil on the affected area and leave few hours or overnight. Apply daily to treat bee strings. Note: You can also apply lavender oil brought from store but homemade is effective. Witch hazel extract contains saponins, choline, bitters, tannin, catechins, gallic acid, flavonoids, proanthocyanins, and volatile oils such as eugenol, hexenol, and carvacrol. These prevent infection and relieve pain, inflammation, and itching. Apply witch hazel extract directly to the bee sting. Or Add few drops of lavender essential to witch hazel. Apply to the sting area. Repeat regularly to get relief from problem. Honey is antibacterial. It prevents infection while soothing pain, itching, and inflammation. Apply a layer of raw, organic honey directly to the bee sting. Leave it on for few minutes to dry and then rinse with cool water. Repeat several times a day regularly until the bee sting heals. Epsom salt contains magnesium and sulfate, which prevent infection and reduce pain, swelling, and inflammation. Epsom salt also helps to draw impurities—including remnants of broken bee stingers—out of the skin. Mix epsom salt with water to make a paste and apply it to the bee sting. Let it air-dry, then rinse it off with cool water. Repeat regularly until the sting has healed. Parsley has eugenol compound which makes it as anti – inflammatory agent. Other volatile oils help to prevent the spreading of infection to other body parts. Use parsley either in diet or poultice. Crush some fresh parsley to make a paste and apply it to the bee sting. Cover it with a bandage or clean cloth and leave it on 3 hours. Remove bandage and wipe the area. Repeat 3-4 times a day until the bee sting heals. Garlic is antibacterial and anti–inflammatory. It prevents infection and reduces swelling. Heat 1 teaspoon of coconut oil or olive oil over low flame. Crush two garlic cloves and add it to the oil. Apply the garlic and oil to the bee sting. Leave it on until the oil absorbs into the skin, then wipe of the garlic with a dry towel. Repeat 3-4 times daily until the sting heals. Calendula flowers, also known as ground or pot marigolds, are antimicrobial, anti–fungal, and anti–inflammatory, and they contain a natural astringent. They prevent infection, reduce swelling, and help heal cuts and wounds. Buy commercially made calendula oil or make your own using the recipe below. Heat 1 cup of olive oil over low flame. Stir in ½ cup of dried calendula flowers. Melt ¼ cup of beeswax over low heat. Stir in ½ cup of calendula oil and 20 drops lavender oil. Before bed, apply the salve to the bee sting, bandage it, and leave on overnight. Remove bandage and rinse in the morning. St. John’s wort—both the leaves and the flowers—reduces inflammation and relieves pain. Do not apply it directly to the skin. Always mix it with bentonite clay to make a paste. The clay neutralizes and absorbs bee venom. Its alkalizing propert helps to neutralize the acidic effect of bee sting. In a bowl mix John’s wort oil and sufficient amount of bentonite clay. Mix well and apply the paste to the sting. Let it dry, then rinse it off with cool water. Rock salt is rich in magnesium and selenium, which relieve pain and swelling, and fennel seeds reduce inflammation. It is an Ayurvedic remedy that helps to reduce the pain, swelling and inflammation. Crush 2 teaspoon of fennel seeds and 2 teaspoon of rock salt with a mortar and pestle. Apply to bee sting and let dry. Repeat 3 times a day till you get rid of the bee stings. The sticky mucilage in marshmallow leaves cools and soothes skin while reducing pain and swelling. Crush, blend, or grind fresh marshmallow leaves to make a paste. Apply it to the sting and let I air-dry. Rinse it off with cool water and repeat daily. Activated charcoal prevents infection and relieves pain and swelling by pulling impurities out of the skin. Mix activated charcoal with enough water to make a paste. Apply it to the sting area like poultice. Cover it with a cloth or bandage and leave it on 15 minutes. For more effective results, keep on changing the poultice until you feel it completely fine. Repeat regularly to treat bee sting. Limewater, also known as choona, comes from a pickling lime. It prevents the infection to spread to other parts of body. Choona or pickling lime has high alkaline and neutralizes the acid in be venom. Rub limewater on the bee sting gently not more than one or two minutes. Allow it to air-dry and wash it off with cool water. Repeat for every 4 hours to get relief from sting. Aloe vera soothes and heals skin and reduces inflammation. Extract gel from a fresh aloe vera leaf. Apply it to the sting and let it air dry. Toothpaste contains glycerin, which helps to dry out the venom which left on affected area. Its alkaline property neutralizes the acid left by bee venom. Apply a small amount directly to the sting and leave it on. Re-apply it every 3-4 hours until the sting heals. Tobacco leaves neutralize the acid in bee venom, reducing pain, swelling, and redness. Use a mortar and pestle to crush tobacco leaves. Mix in enough water to make a paste. Leave on 15 minutes, then rinse with cool water. When you are going to any bee hive areas don’t wear bright, floral-print clothing, perfume or use scented beauty products. Keep your distance if you’re around bees. If you’re stung, wash the sting immediately with warm water and mild soap. Apply calamine lotion to the sting and leave for 45 minutes and reapply for every four hours. Place a potato slice on the sting to relieve burning. Apply hydro-cortisone cream to relieve itching and swelling. Crush jewelweed leaves to make a paste and apply it to the sting. Apply onion juice to the sting regularly until it heals. Cover food containers and trash cans so as not to attract bees. Do not swat at bees if they come close. Stay calm and walk slowly away. If stung, drink lots of water to flush toxins from the body. Get plenty of sleep to strengthen your immune system. Take some pain killers like acetaminophen or ibuprofen to relieve the pain. Crush bee balm and apply on the bee sting to get instant relief from the bee sting. If you are allergic to bees, or if your symptoms do not subside with regular use of these methods, consult a doctor. Have you tried any of these methods for treating bee stings at home? Tell us which ones worked best for you!